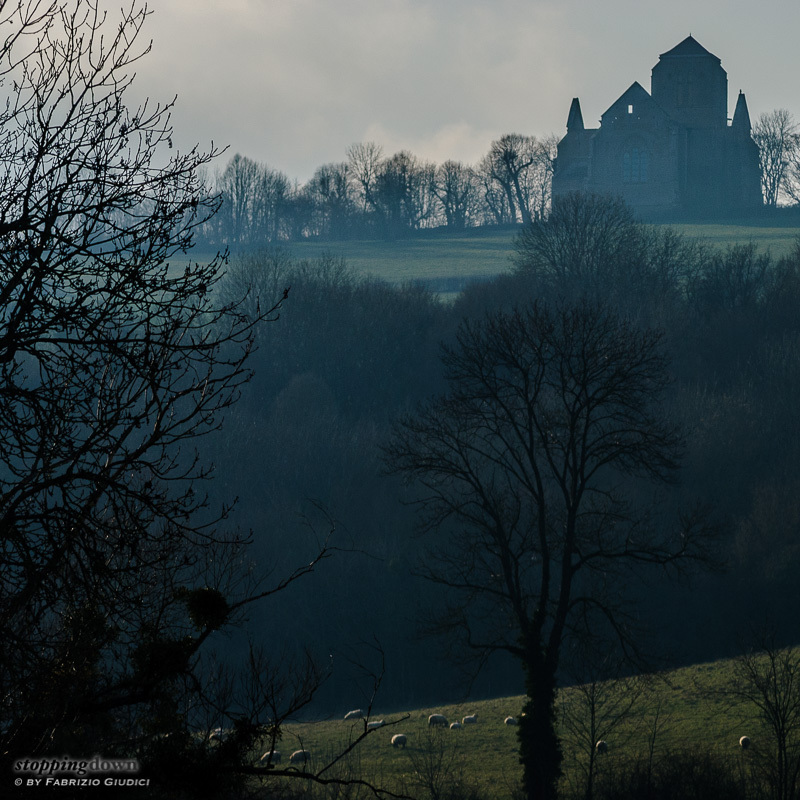 A couple of years ago I noted along the highway from Dijon to Auxerre the tourist signal about the Butte de Thil, a hill where - as I later discovered on my Michelin guide - an ancient castle and a Gothic church were built. This year I was able to make a detour to visit this place. Nikon D200 + Nikkor 180mm ƒ/2.8N ED-IF AF @ 180 mm, 1/320 sec @ ƒ/4, -0.33 EV, ISO 140, hand-held. I made many shots as the above one, which are good but didn't satisfy me. The church, a Gothic jewel, is a ruin and the hill is lonely and with a mystery mood, an atmosphere that isn't properly rendered by the “standard” perspective. So I looked at the map and drove around the hill, searching for a better idea. While I was about to give up and drive again towards the highway, I saw the church silhouette in backlight - it was what I was searching for. I searched for a view with some trees in the foreground - the winter look of trees adds to the gloomy atmosphere of the shot. 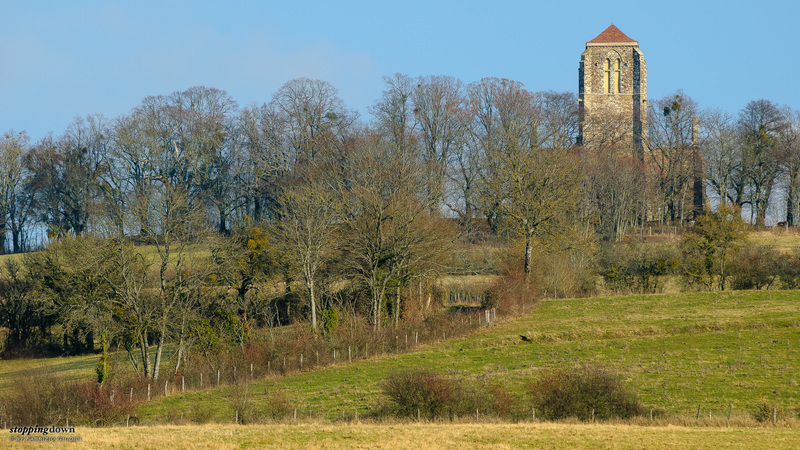 The photo was post-processed adjusting curves so trees in the foreground appear black and an intermediate layer of vegetation is just a bit brighter; at last, the church is in silhouette, but I recovered a bit of details to recall its once-majestic architecture. I was lucky as I found some pasturing sheeps on a meadow, a further detail recalling a desolated land. Nikon D200 + Nikkor 180mm ƒ/2.8N ED-IF AF @ 180 mm, 1/320 sec @ ƒ/7.1, -0.33 EV, ISO 220, hand-held.